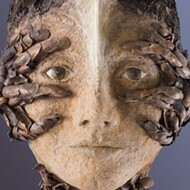 The year's first and brightest inclusivity signal flashes in Women of the Research Studio: Past and Present, the latest exhibition at the Maitland Art Center. The show brings together work from the Maitland Art and History Association's Bok Fellows from its permanent collection with work by Nikki Painter and Elisabeth Condon, two recent MAC Artists-in-Residence. Artists once lived at the Research Studio, as it was known from 1938 until it closed as an artist's colony upon the 1959 death of its founder, Jules André Smith. (In recent years, the Art in Residence program has been reinstated to great success.) Mary Curtis Bok, Smith's patron, sponsored some 60-odd "Bok Fellows" who wintered in Maitland to experiment and create new art. 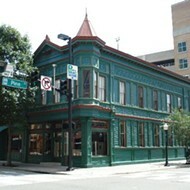 Many were female artists, marking the Research Studio on Florida's early map of equality. Painter March Avery stayed twice with her parents, Milton and Sally Avery. "Mom and dad loved that place," she recalled to me when I researched the Art Center for potential National Landmark status. 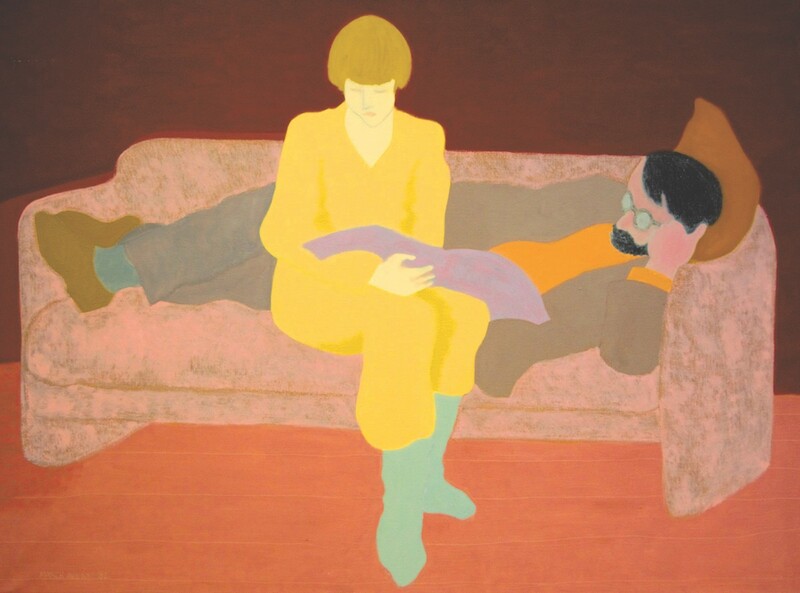 She donated her painting "Two Readers on the Couch" to the Art Center in their memory – it portrays the couple's intimacy in spare color fields, showing the strong influence of her father. In Women of the Research Studio, Avery, along with Minna Citron, Jan Gelb and Doris Lee, show us the midcentury emergence of women artists in the modernist movement. The next gallery fast-forwards the viewer to women of today, with the paper constructions of Virginia-based artist Nikki Painter. Painter designs each piece meticulously – delicately orchestrated geometric patterns of day-glo colors sliced and interlaced into fascinating textural studies of gardens, architecture and windows. Fluorescent colors that are found in nature, such as in coral reefs and other sea life, fascinate Painter, she said during her artist's talk. Two works in black-and-white are part of her Night Garden series, drawings that echo the others but with a mysterious, pixelated essence, at once otherworldly and relevant to our digitized, polarized times. 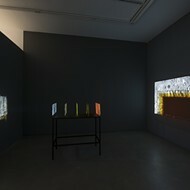 Manhattan-based artist Elisabeth Condon brings her paint-pouring technique to full bore on an installation in the last two galleries. "Chinese scrolls, both in technique and composition, influenced me a lot," she says, "but when I saw Smith's Mayan paintings and sculpture here at the Art Center – wow! The earthiness knocked me out." 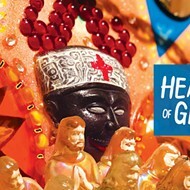 In her installation, Condon references the Mayan fertility goddess and other deities found in and around the Art Center. 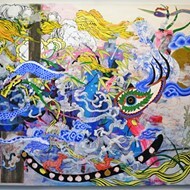 The goddess seems at home in these sophisticated compositions of spontaneous swirls of color. Women of the Research Studio is only a tiny sampling of the incredible female creativity arising from this place. The work in this show stands on its own; one need not know whether the artist is a man or a woman to feel each work's power, but this exhibit starts the new year off with a clear message about the need for equality that is timely, as the future of feminism is here and now. Editor's note: This story was updated to correct following errors: Nikki Painter is based in Virginia, not in Baltimore, as previously stated; and Elisabeth Condon is based in Manhattan, not Brooklyn.